Additional research provided by Alexander R. Stoesen. Salem was officially established in 1772 as the main town on the Wachovia Tract, the 99,000-acre tract of land the Moravians purchased from Lord Granville in 1753. While the highly organized Moravians originally intended to build their "town of trade and manufacture" shortly after arriving in Wachovia in 1753, construction on Salem did not begin until 1766, when the first residents moved to the still-unfinished town in the wilderness. Spurning the circular town plans drawn by Count Nicholas von Zinzendorf, Wachovia administrator John Frederich Marshall opted for a grid plan that placed the main buildings of the town (the Gemein Haus and later Home Moravian Church, the Single Brothers House, the Single Sisters House, and the general store) on the central square. Establishments such as Salem Tavern, which would be frequented by "strangers" or non-Moravians who could be disruptive or negative influences on town residents, were removed from the square. Single Brothers House at Old Salem, restored in 1964 to its 1769 condition (brick addition, 1786). Photograph by Tim Buchman. Courtesy of Preservation North Carolina. By offering a full complement of German artisans and their wares and services, as well as a general store and tavern, Salem became the economic center of the North Carolina backcountry shortly after its founding. Even though the Moravians abandoned their semicommunal lifestyle when moving from Bethabara to Salem, church boards still tightly controlled all economic and social aspects of life in Salem through a lease system. As business prospered, however, the Moravians gradually relaxed their grip on Salem's economy and society, allowing a more typical American capitalism to have freer rein. Business moved from individual shop production by artisans to production in manufactories, such as those for textiles. The church ended the lease system in 1856 and, some three years later, ended all pretense of control, so that Moravian businesspeople operated in the same manner as their non-Moravian neighbors. Freedom from all church restrictions meant that business in Salem continued to succeed and, in the process, expand the town's geographical boundaries. By 1849 the local population had grown to the point that a new county, Forsyth, was created, although its courthouse was situated not in Salem but in the newly created town of Winston. Political differences kept Salem and Winston (which became a manufacturing center for tobacco) separate until well after the Civil War. An ill-fated attempt by Salem's political leaders to consolidate the two towns under the name of Salem failed in 1879. But an 1888 chamber of commerce pamphlet championed Winston-Salem as "the Twin City"; by 1899 residents got their mail addressed to "Winston-Salem"; and in 1913 the towns officially consolidated as the city of Winston-Salem. The idea for the preservation and restoration of historic Salem, or Old Salem, originated in the late 1930s, but the work did not begin in earnest until after World War II. Postwar prosperity brought a boom in construction to Winston-Salem and Forsyth County, which led to the creation of a joint city-county temporary planning commission to try to bring order to the rapid growth that was taking place. By the spring of 1947 a permanent planning commission was in place. This came just as a proposal to build a grocery store in what is now the center of Old Salem appeared. Plans for the store threatened the oldest remaining building in Old Salem, which, even though it was very run down, was known to be of historic significance. The proposal put the commission to its first test, and it was decided to move beyond zoning into the preservation of large areas, something new to North Carolina. The Citizens Committee for the Preservation of Historic Salem was created, with the aim of developing a careful study of the structures in Old Salem. This, and the work of professional planners, including Russell Van Nest Black, culminated in the development of a citywide zoning plan that included the Old and Historic Salem District. The plan was placed in effect in 1948. In the meantime, a ban had been enforced on any new construction in the old area, which made some property owners uneasy. The concept of a historic district was on shaky legal ground in North Carolina at the time, since the establishment of such districts had never been attempted before. The leaders of the Winston-Salem preservation effort knew that the key to their situation was to avoid a court case challenging their work. Fortunately, the idea of preservation was taking hold and spreading around the state. By the 1960s the General Assembly began to approve preservation legislation for other areas, and it looked to what had been done in Winston-Salem as a way to create laws that would stand the test of time. The first project to be completed in Old Salem was the Eberhardt House, along with several of its dependencies, which dated from 1832. This project was completed in 1951 and depicted the 1832 condition of the structures. By 1985 a total of 63 projects had been completed, although work continued on other projects. The most popular place is Salem Tavern, with its dining rooms that were restored to their original 1816 condition in 1968. Other popular buildings are the Miksch Tobacco Shop, restored to its original 1771 condition in 1960, and the Winkler Bakery, which dates from 1800 and was restored to its 1818 condition in 1968. Perhaps the most memorable building is the Single Brothers House, which was restored to its condition of 1769 (the half-timbered original) and 1786 (a brick addition) in 1964. The Single Brothers House is the first stop in Old Salem after the visitors center and is the central point for obtaining information from appropriately garbed guides and living history demonstrations of the arts and crafts of people who lived in Salem in colonial times. A number of Salem's houses are either privately owned or owned by Old Salem, Inc., the corporation that oversees the historic district, and rented out to individuals, which makes Old Salem a viable residential enclave in Winston-Salem. This is the result of restoration and reconstruction projects in which work on privately owned buildings has been carefully controlled so that the appearance of each conforms strictly to the exact requirements of the historic district. 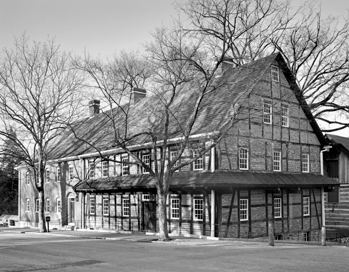 The fact that the Moravians kept careful and exact records of the buildings that comprised the town has enabled the corporation to carry out this work. Some private homes are open to the public on special occasions. In order to provide continuity and financing, a charter was obtained from the state creating Old Salem, Inc. This enabled a board of trustees to acquire property and to develop long-range plans for financing the projects that have been undertaken at Old Salem. Relying at first on contributions from wealthy benefactors, the corporation has since developed more sophisticated and stable methods of financing. Today, the largest part of the corporation's funding comes from income generated by admissions, while endowment income and a combination of enterprises also contribute to funding. Old Salem has received allocations from state and local governments, as well as grants from federal agencies. C. Daniel Crews, Villages of the Lord: The Moravians Come to Carolina (1995). Frances Griffin, Old Salem: An Adventure in Historic Preservation (1985). Johanna Miller Lewis, Artisans in the North Carolina Backcountry (1995). Daniel B. Thorp, "The City That Never Was: Count von Zinzendorf's Original Plan for Salem," NCHR 56 (Summer 1984). Thorp, The Moravian Community in North Carolina: Pluralism on the Southern Frontier (1989). 1 January 2006 | Lewis, Johanna Miller; Stoesen, Alexander R.
Hello. Where can I find the citation information on all ncpedia.org sites that I'm using? Here is some information about citing NCPedia articles: https://www.ncpedia.org/writing-and-citing-ncpedia-articles. I hope this helps. Please feel free to respond to this post with more questions or comments.